Since 2000 there has been a rise in the opposition to animal research across much of Europe. The tactics of animal rights groups in Europe have been very similar to those in the US, including rallies, hate campaigns, vandalism and targeted-violence. These activists have targeted both companies (such as Novartis, in Spain, Switzerland and Italy) and universities (Universities of Cambridge and Oxford, UK) and they have even targeted individuals (such as Andreas Kreiter, in Germany, who was targeted with newspaper ads). There are exceptions to this increased opposition, for example the UK, where scientists are better organized to counter animal rights claims, support for animal research remains high, and in Italy, where support for animal research has increased recently as the scientific community there has started to speak out. Though quite predominant in the northern Europe, this movement has been mostly absent from southern countries, with the notable exception of Italy, and almost non-existent in Portugal. However, in recent years, there has been increasing interest on this matter amongst the general public, as well as the appearance of new AR movements that are against all forms of animal experimentation. Moreover, more and more groups and individuals are bringing up the discussions about animal rights. Groups such as Liga dos Direitos dos Animais (Animal Rights League), Associação Animal (Animal Association), União Zoófila (Zoophile Union), among others, were founded by the late 80’s, early 90’s, but are increasingly active. It must be said, however, that most of these groups are non-profit public utility associations, mostly involved with the protection of domestic and wild animals, bringing together volunteers working at municipal kennels, catteries or programs for the conservation of endangered species. They try to promote awareness to issues pertaining animal rights and they also help to raise money for important Conservation Programs (such as the Grupo Lobo that focuses on the conservation of the endangered Iberian Wolf, or the Lynx Program, organized by the LPN). They do some important work in a country where bullfighting and pet abandonment are unfortunately still relevant issues. For some of these groups, however, this is not the case and, though their tactics remain relatively peaceful, their goals are closer to those of other international AR groups, such as PETA. One of these, Associação Animal, is arguably the most active AR group in Portugal. Just like their international counterparts, it stands for the “ethical treatment of animals” and opposes animal experimentation, including for scientific research. Also similarly to what happens for other groups, their website is filled with the most basic arguments against animal research, and the most glaring lies. 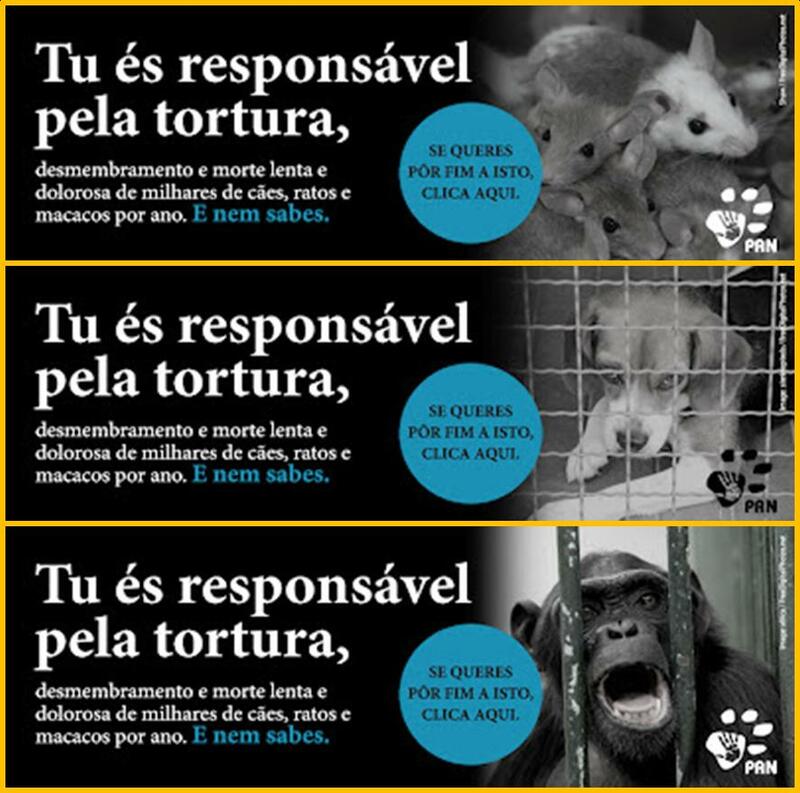 In the section explaining their view on Animal Experimentation (no English version for the website), they start their article with a photo of a monkey and the sensationalist title “Animal Experimentation: Violence in the name of Science”; this, despite the fact that there is no animal experimentation on monkeys in Portugal. The article goes on explaining to the readers that “in the UK alone, almost 3 million animals are killed annually in laboratories. In Portugal, the use of animals in experimentation is currently an unregulated field”, which couldn’t be further from the truth. There is definitely room for improvement when it comes to surveillance and there is a need for better record-keeping. Nevertheless, the very same laws applied in the rest of the EU pertaining animal experimentation, are also being applied in Portugal. Another interesting “fact” that we can learn from their website is that “at least 65% of the [animal experimentation] procedures are done without anaesthesia” and that “in the remaining 35% of experiments regularly done, it’s certain that these imply the infliction of pain and suffering”. It is unclear where these statistics come from, nonetheless their use is misleading. Anaesthesia should only be used when its administration doesn’t cause more pain or distress to the animal than the procedure one needs to perform, without anaesthesia. So, in fact, this number may only show us that the majority of the procedures performed don’t require anaesthesia – they tell us nothing regarding their necessity. As for those “remaining 35%”, if they correspond to experiments done under anaesthesia, and if they are done properly, then their whole point is to alleviate any “pain and suffering” for the animal. The next topic, “Animal Experimentation in Portugal”, seems, at last, to bring us some actual facts: “In Portugal, there is also animal experimentation, specifically in the National Lab for Veterinary Research, in the zootechnical stations of the Ministry for Agriculture, in the Faculties of Medicine, Veterinary Medicine, Sciences, Pharmacy and Psychology, in some scientific research facilities and in some private labs”. 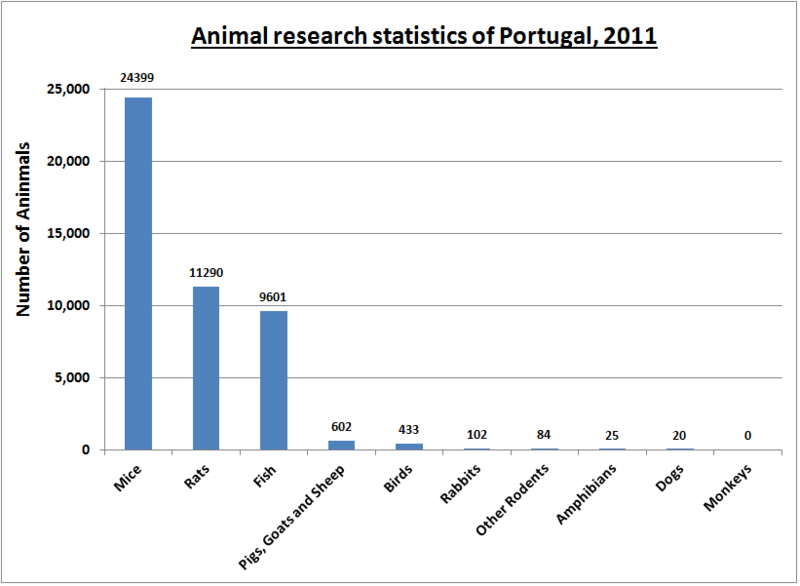 But, alas, they end the topic showing a tremendous taste for misinformation, mentioning experimentation in cats and primates, which are not used for experimentation in Portugal at all (see graph above). All their other arguments are so commonly used and so basic that they are barely worthy of attention. But for information sake I’ll just leave a synopsis of their two big arguments against animal research: 1) animal testing leads to “dead-ends” that block scientific progress, and 2) while researchers are still resorting to animals as “cheap and easy to get and to use research resources”, there’s no true stimulus to find non-animal alternatives for research. I will not take my time rebuking these, for they have been extensively addressed by SR before (1 2, 3, 4, and our FAQ). Associação Animal has been rapidly gaining momentum and their arguments are designed to convince people who have no other sources of information than the one they provide. 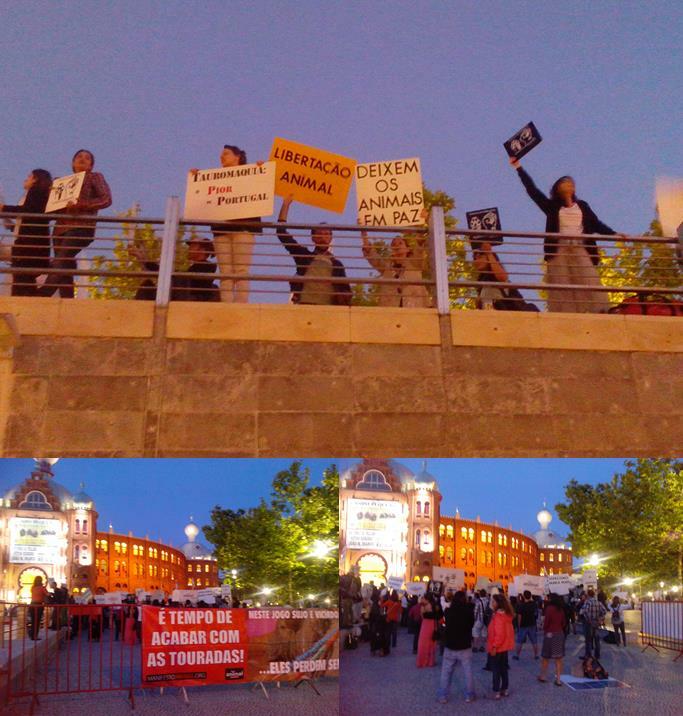 As for demonstrations, they have been relying on the general anti-bullfighting movement, by organizing anti-bullfighting demonstrations, but then introducing “anti-vivisection” signs in the middle of the crowds. Interestingly, both a review from 2012 and the 2010 Eurobarometer conclude that the majority of the Portuguese population is favourable to animal experimentation for Biomedical Research purposes, most of them regardless of the animal species used. Their increasing notoriety seems to coincide with the legal creation, in 2011, of PAN (Party for Animals and Nature), a Portuguese party that managed to gather 1.72% of all votes in the last European Elections (though voter turnout was only 33.67%), thanks to the most basic and sensationalist arguments. Among other things, PAN has started a petition to “substitute animal experimentation for alternatives that – to paraphrase Animal Welfare Specialist Nuno Henrique Franco – makes me wonder how much of what it implies is the result of deliberate intellectual dishonesty. All the ideals of PAN and Associação Animal are making their way into the media, their demonstrations having more and more supporters and their media attention increasing. Also, the impact of such groups in Portugal is becoming very clear, though their tactics seem very peaceful. Recently, the Bioterium of Azambuja (a central breeding centre for animal research purposes) was dropped by the Portuguese Government after pressure from the Plataforma de Objecção ao Biotério. On the other side, on the scientists’ side – who should be the first to speak up – there seems to be only silence, either for lack of concern, for lack of organization, or for fear, I can’t say. What I know is that, if nothing is done, we very well may find us in a country where these kind of arguments, fallacious and false, might just be the only ones who actually reach people. And if people and politicians make their judgement (and vote accordingly) based solely on that information, we can’t condemn them in the end – only ourselves. Posted on September 30, 2014 by EditorPosted in Animal Rights News, Campus Activism, NewsTagged animal rights in portugal, antivivisection europe, Portugal, Portuguese animal rights. in your excellent article you forget to cite the main exemption in europe which concerns France:THis country is the larger user of animals in the EU, and there is almost not if any activist activity. This is due to the fact that the stuff is strongly managed by a large association the GIRCOR who represents both academic and industrial research. The association has for a while (more than 20 years) established a permanent dialogue with the media, the population and the public opinion, opened the laboratories and promoted the ethics in animal research with as main result to almost tottaly discourage activist in our country . If you are interrested wee will be happy to provide you informations on our strategy and its results.